A passenger on a Delta Air Lines commercial flight captured this rare photograph of the condensation trail formed after the US space shuttle Endeavour was launched on Monday. It quickly became one of the most popular items of the day on Twitter, the social network site, and had been seen by hundreds of thousands of people. 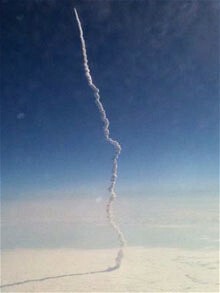 The trail is informally known as a “rocket road” among staff at the Nasa base at the Kennedy Space Centre but it is rarely captured on camera. The photograph clearly shows the contrail, which has been twisted by high-altitude winds and whose shadow lies along the clouds below. t is set against the curve of the earth and the sky blackening towards the limits of the atmosphere. Among the spectators on the ground was Gabrielle Giffords, the Arizona politician shot in the head by a gunman in January, who is the wife of Mark Kelly, Endeavour’s commander.